Good beds, blankets available and used as was wintertime visit. Kitchen well kitted. Audio speakers in the ceilings of each room. Luckily I knew about this before traveling so I bought my own Aux cable. Huge balcony and comfy beds. Good location near the train station, very good bed, well equipped kitchen. We had Studio room. Ok for a short stay. The kitchen is spacious and has quite good facilities. It's suberb to have both a washing machine and drier as well as a dishwasher. Also the pool area is great and warmed jacuzzi in December was a great bonus. Library downstairs has a great collection of books in various languages! The location is excellent, close to a supermarket where you can find anything you need, close to a railway station and the beach, lot of restaurants around. The rooms are spacious indeed and the kitchen is well equipped. The air con once it was fixed works brilliantly, the chamber maids are all very nice, good apartment. Staff always friendly, the hotel always clean. Asked for extra chairs on balcony as they were 4 of us and only 2 chairs and we got them quickly. Ramon the pool lifeguard is fantastic. 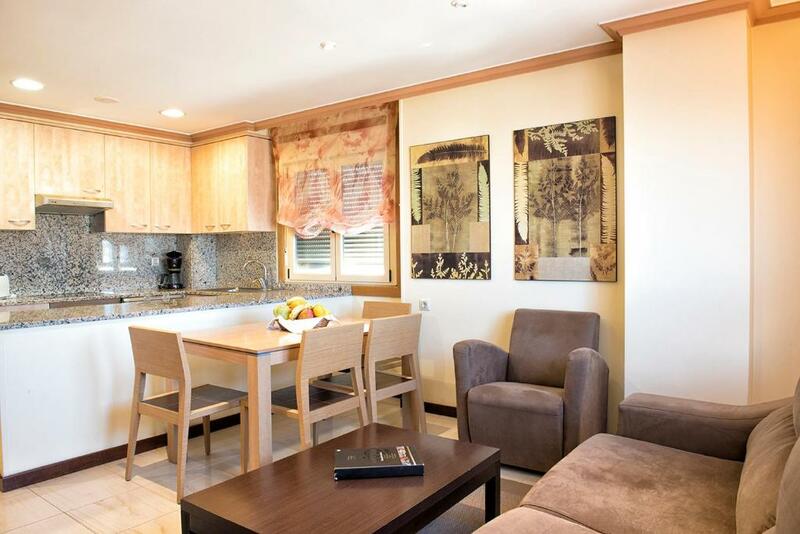 Apartamentos Mediterráneo Real This rating is a reflection of how the property compares to the industry standard when it comes to price, facilities and services available. It's based on a self-evaluation by the property. Use this rating to help choose your stay! 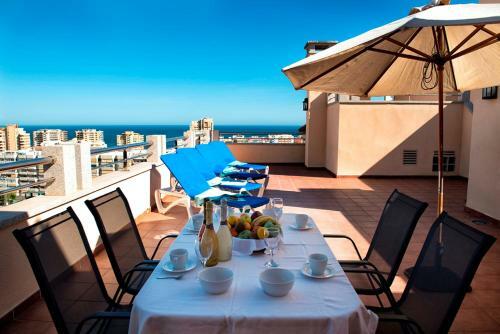 One of our top picks in Fuengirola.Apartamentos Mediterráneo Real is set 10 minutes’ walk from Los Boliches Beach and 1.2 mi from Fuengirola. It features an outdoor pool and stylish apartments and studios. 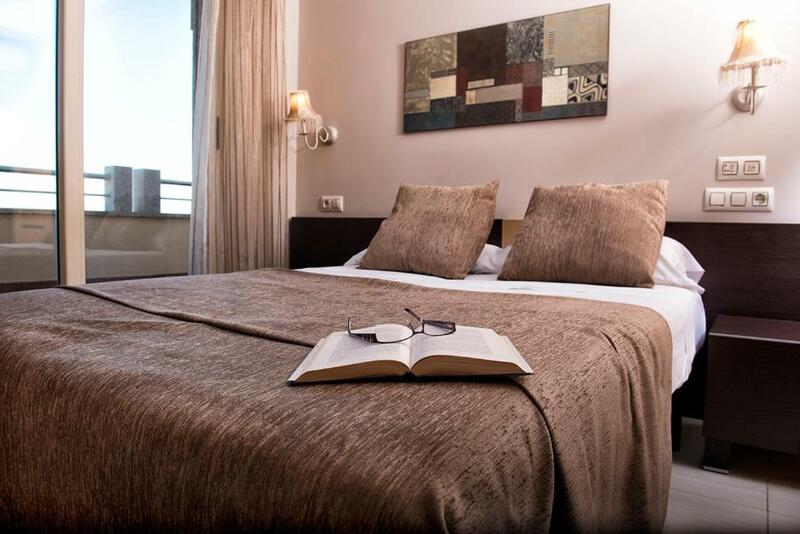 All well-equipped accommodations at the Mediterráneo Real has a spacious seating area with satellite TV and a DVD player. There is also heating, a safe and ironing board. Kitchenettes have a dishwasher, fridge-freezer and microwave. They also have an electric hob, toaster and coffee-maker. The pool is adapted for guests with reduced mobility. The restaurant offers a range of Spanish and international dishes. There is a small selection of shops, bars and restaurants in Los Boliches and in the neighboring resorts of Fuengirola and San Francisco. Boliches Train station is just 5 minutes’ walk from the apartments and offers easy access to Málaga. Marbella is a 30-minute drive away. Staff at reception can arrange airport transfers for you. 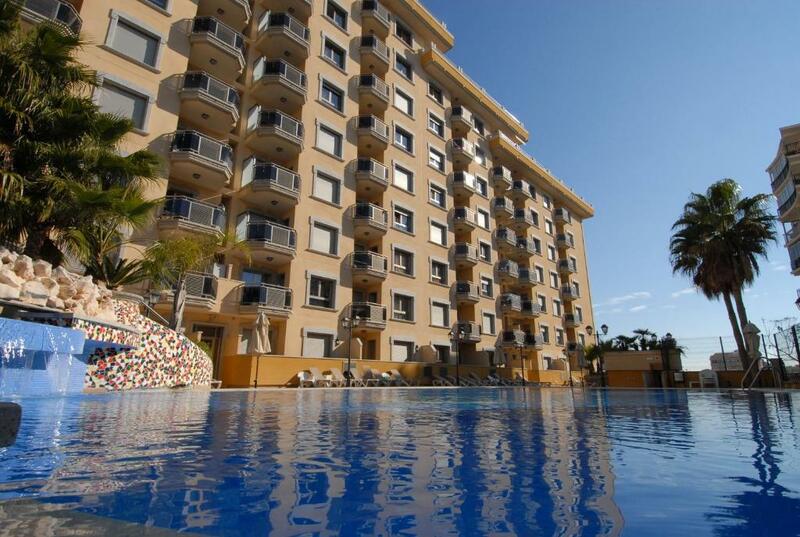 When would you like to stay at Apartamentos Mediterráneo Real? 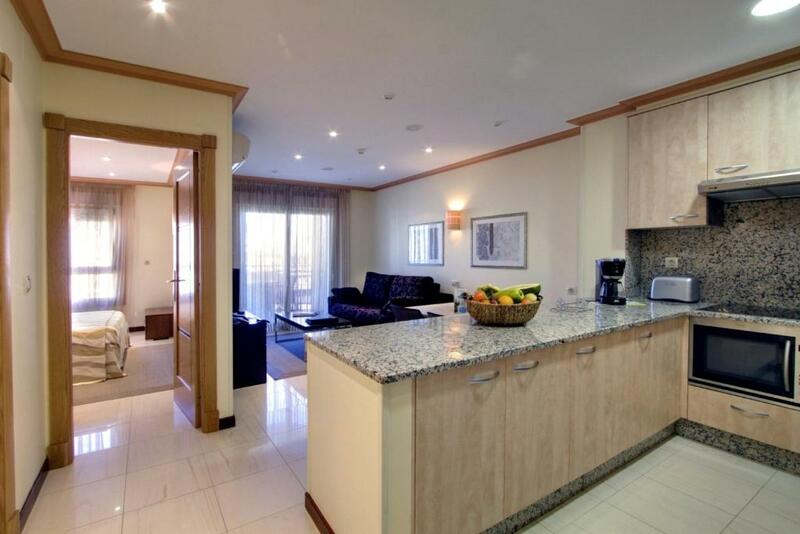 This air-conditioned apartment has a safe, satellite TV and washing machine. There is a CD and DVD player, private bathroom with a hairdryer and toiletries, and a well-equipped kitchenette. This large air-conditioned attic apartment has 2 bathrooms and a private terrace. The living room has a safe, sofa, satellite TV, CD and DVD player. The private bathroom comes with a hairdryer and toiletries. 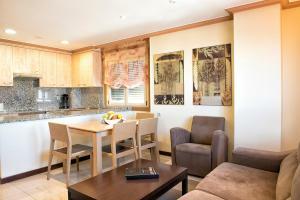 There is a well-equipped kitchenette with a washing machine and dishwasher. Air-conditioned apartment with a balcony. The living room has a safe, sofa, satellite TV, CD and DVD player. The private bathroom comes with a hairdryer and toiletries. There is a well-equipped kitchenette with a washing machine and dishwasher. Disponemos un total de agradables y lujosos apartamentos de uno y dos dormitorios. Entre ellos, siete áticos con espléndidas y amplias terrazas. Como usted ya puede ver y experimentar nuestros apartamentos están construidos con una alta calidad, totalmente equipados, disponiendo de la última tecnología. Apartamentos Mediterráneo Real, está situado en la pintoresca zona de pescadores "Los Boliches", en la famosa ciudad costera de Fuengirola. Al alojarse en Mediterráneo Real, todo lo que necesita está a un paso de su puerta. A unos 400 metros se encuentra la larga playa dorada lindante con el Paseo Marítimo y se extiende el agua cristalina del Mar Mediterráneo, donde se pueden practicar un sinfín de deportes acuáticos, relajarse bajo el sol Mediterráneo o disfrutar un agradable recorrido por el paseo marítimo. House Rules Apartamentos Mediterráneo Real takes special requests – add in the next step! Apartamentos Mediterráneo Real accepts these cards and reserves the right to temporarily hold an amount prior to arrival. Please note, use of a safe costs EUR 2.50 per day. The property offers free WiFi for one device. Connecting additional devices bears a surcharge or EUR 2,50 per day and EUR 10 per week. 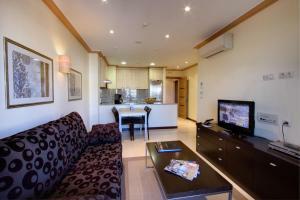 Apartamentos Mediterráneo Real offers airport shuttle service for an extra cost. The apartments are cleaned every other day, bed linen are changed once per week, and towels are changed 2 times per week. Cleaning of the kitchen and terrace is not included. Please note that the apartments are not soundproofed, but feature double glazing to isolate noise and maintain the temperature inside. Please note that no reimbursement will be made in case of early check-out. Please note that the on-site restaurant will be closed from 21 December until 12 January, 2020. Aux cables could have been provided. Shower in en suite temperature was a bit temperamental. No inflatables allowed at the pool. Staff not friendly especially one young girl in the reception who never said hi and looked rude and miserable. Luckily the room cleaner was a lot friendlier and helpful. Every year this hotel looks older and older and needs a little bit fixing around (broken sun umbrellas, old washing machines, Wi-Fi which doesn't work etc). Over priced, no value for the money. The pool and Jacuzzi were not warm enough to be pleasant to use during what proved to be cool weather.I would have expected the pool to be a much higher temperature. I requested a bath and although most rooms had showers o not they were able to meet this request. The standard of the apartment was high. We didn't like the room that we were given when we arrived (1st floor) and immediately asked for a room higher up. We were charged 30 euros for this change even though we didn't used the first room. The room was located on street level, no balcony, windows were facing on a cement wall of the narrow back yard fence. No views at all. We were planning to show the place to our relatives who spend time in Costa del Sol and wanted to see the place if they would book it for their next year stay. They decided not to even consider. Looking from outside the place has rooms with better views though. Cleaning of the room during our stay was not done properly, although in coming everything was super clean. We have stayed at least four times in this apart hotel, once about four weeks, and were most happy earlier. Now it seems that the regular maintenance is completely overlooked, for example the electric wiring of hair dryers were visible or fixed with tape, shower tubes were broken, the blankets ans sheets are badly worn out. It is a great pity because the rooms are well and nicely constructed and comfortable as such. As a whole, it is not worth of the price you have to pay. Shadowy apt. and balcony. Wifi is totallly substandard, although they promise free wifi. Many minor things are missing, which go without saying elsewhere. To complain means nothing, although receptionists try to do what they can. The management is obviously quite incompetent.